Who Comes First at J. P. Morgan? Weighing In: Who Comes First at J.P. Morgan? Several years ago I attended a meeting at a major Southeast bank that was just starting to sell alternative products (securities, mutual funds) to its customers. It intended to market the product offering as open-architected, which meant customers would have unrestricted choices for the investment of their assets. However, the CFO was quick to point out investors would only have freedom of choice for half of their assets. The other half had to be invested in bank products so the bank’s profit model would work. 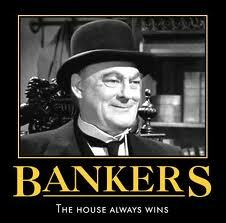 Every major bank and financial institution that produces its own products is faced with this choice. Do they do what is best for their clients, freedom of choice, or do they restrict investor choices and do what is best for the institution’s bottom line? Very few financial institutions, in particular publicly held institutions, are willing to forgo the additional profit associated with the sale of proprietary products. Increased profit means bigger bonuses for the executives and higher share prices. It should not be a big surprise that J.P. Morgan has been accused of this all too common Wall Street business practice. See Ex-J.P. Morgan broker: Firm pushed house trends. A former broker at the firm has stated it strongly discouraged the sale of third party funds to investors even though the third party funds produced better results for lower expenses. The NY Times also reported this anti-investor business practice almost a year ago. Where does the buck stop? You can make the case it is the investors’ fault when they have this information and fail to act on it. Wall Street counts on this apathy to retain control of their assets. More proactive investors use thousands of independent Registered Investment Advisory firms that put their clients’ interests first. Unlike J.P. Morgan these firms are held to the highest ethical standard in the financial services industry. The foundation of the standard is putting investor interests first.